In 1951, Egyptian architect and educator Ramses Wissa Wassef embarked upon an experiment in creativity which would become universally acclaimed. He set out to prove that creativity was innate -- that anyone could produce art. He had become discouraged by the general decline of creativity in 20th century urban culture and dismayed by the deadening influence of mass production. He felt that routine education was stifling. For his experiment he chose uninhibited, free-spirited young children who were isolated from many aspects of modern civilization. Tapestry was selected as the ideal medium because it demanded dedication -- it was one in which an artist matured slowly. Wissa Wassef explained in a 1965 interview, "Though the mastery of the technique requires a long period of fruition... from the very beginning a child can find something in it. There are numerous difficulties to be overcome, but the achievements prove a veritable conquest, all the richer since the difficulties are greater..."
After working with a few children in Coptic Cairo, Ramses moved to the rural village of Harrania, thinking it an ideal place to find youngsters unspoiled by previous schooling and thus able to express themselves freely. At that time the only textiles produced in the area were simple utilitarian rugs and blankets. 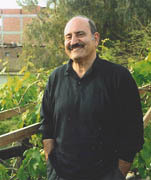 Wissa Wassef built a home and studio at the edge of the village, with a playground, pens for animals, and a garden for dye plants. Interested neighborhood children were given beautiful handspun, vegetable-dyed yarns in a variety of colors and taught basic tapestry techniques. Wissa Wassef suggested that they "tell a story" with their yarns. The children began with small frame looms and only two or three colors. Their works grew in complexity and size as they gained skill. No one corrected their designs, proportions, or perspective; no one questioned their pink camels or blue donkeys. Absolutely no adult criticism was allowed -- even from parents. Since it was expected that technical skill would be achieved gradually, no child was inhibited by an undue concern for straight selvages, perfect rectangular dimensions, or flat surfaces -- very difficult matters with the eccentric wefts of tapestry. Originality was encouraged as the most important quality. Much of the strength and charm of the successful tapestry designs was due to their direct growth out of the weaving process. No preliminary drawings were used, even for large, elaborate works. The best pieces had a lively internal rhythm as well as lyrical, vibrant color. Under Wissa Wassef's careful tutelage his students produced work that had a fresh vivacity and presented candid views of rustic village life. It had a direct honesty and a simple, solid power. Unfortunately, Ramses died in 1974, but his wife Sophie and daughters Yoanna and Suzanna continued to operate the studio. 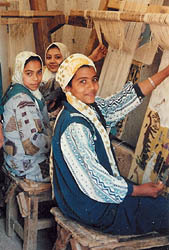 Children in Ramses' Harrania studio initially ranged in age from six to eight and they were exposed to no adult work. Eventually the studio included weavers of all ages, and children who played near their mothers' looms were eager to try weaving on small looms themselves; they played at weaving much as other youngsters imitated their mothers' housekeeping activities. Now the weavers remaining in the Wissa Wassef complex are all adults, and no young people are being accepted in that studio. In 1976 Egyptian engineer Fouad El Awadly and his German wife Irmgard founded a workshop in Harrania to expand opportunities for villagers wishing to weave, and to further the important creative work begun by Ramses Wissa Wassef. The Awadly studio is still flourishing and here young people can learn to weave today, as in the earlier Wissa Wassef studio days. The workshop is an integral part of the farming community, where both children and adults decide on their own studio hours, are free from all pressures, and find their individual creative expressions enthusiastically encouraged. 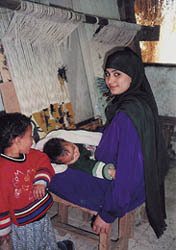 Mothers bring their babies along to the workshop, and small children play in the garden. 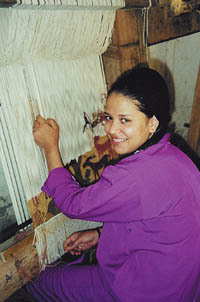 Young weavers may participate in their after-school hours or during summer vacations. The Awadly family actively tends to the special needs of their talented artisans and the relaxed, happy atmosphere is reflected in the joyful tapestries. In this workshop, top quality, finely spun wools are dyed in a wide range of beautiful colors with natural dyes. Until recently, this aspect of the work, along with many others, was carefully supervised by the late Irmgard El Awadly. 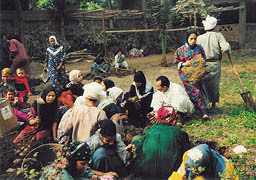 Several dye plants were cultivated in the studio gardens, and in the photo below, a group of weavers help to collect the madder roots used for a variety of red dyes. 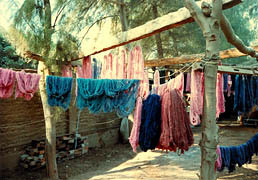 Yellows are dyed with reseda, beige and brown tones with henna and campher leaves, bluish reds with cochineal, and blues with indigo. Intermediate hues are achieved by overdying. Many of the most exquisite and imaginative Egyptian tapestries now come from the Awadly workshop, and range from naive to sophisticated works -- from children's pieces to works by master weavers. The subjects center on local village life and festivities -- animals, birds, plants and people from the weavers' rural surroundings. 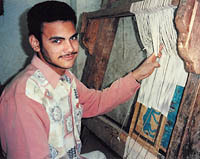 In the Harrania workshops and elsewhere in Egypt, most tapestry weaving is done on primitive, upright frame looms, each with a single stationary heddle bar. The looms are basically the same as the haute lisse looms in the European Gobelin studios. 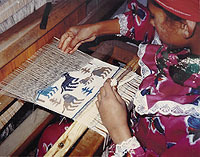 Weavers interlace the yarns with their fingers and press them into place with small comb-like tools. The technique is slow: in a month's time, an accomplished weaver may produce only a square yard or two of wool tapestry, depending upon its intricacy. The most finely-woven Egyptian wool pieces now originate in the Awadly workshop (right), while miniature tapestries of fine cotton are woven on conventional treadle looms in the Wissa Wassef studio (below). Two to three months may be required for a single tiny cotton weaving. Each Harranian weaver has complete control over his own product, large or small, and in these studios each weaver is paid for even his earliest, most rudimentary pieces. The artisans have rarely elected to keep their tapestries, and I have seen young girls bargaining astutely with peddlers-- spending their weaving money for colorful new dresses. Individuals who have continued weaving since childhood are now affluent members of their communities, since their large, dramatic tapestries command substantial prices. Some of the adult artists who began weaving as children with Ramses Wissa Wassef have left that studio to work independently; some even have their own young students -- sons and daughters or neighborhood children. 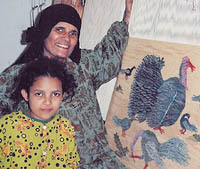 Samhira Ahmad, Rowhia Ali, and Garia Mahmoud, shown together at the right, are among the most well-known independent artists in Harrania. In the late 1960's, as the financial success of the Harranian experiment first became obvious to others, the inevitable imitators appeared in surrounding villages. The old adage, "Imitation is the sincerest form of flattery," certainly applied, but many lifeless copies of the Harrania work were produced -- and still are today. The most perceptive and imaginative individuals elsewhere, however, have produced original work and exceptional examples pop up in unexpected places, displaying diverse styles. 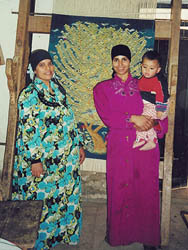 Tapestry weavers are especially active in Kerdassa and Monofia. 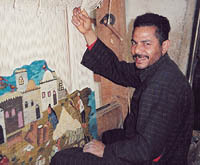 Although Ramses Wissa Wassef once commented that he would love to see tapestry weaving in every village, he might well have wished that better guidance was available to direct the expanding production. Individuals like Nasr Salem in Kerdassa have offered valuable support to young weavers, while encouraging new avenues of creative expression. Unfortunately, the Egyptian bazaars and shops in tourist areas are full of coarse, dull, purely commercial weavings with little artistic merit, while the work from some studios has taken on an unfortunate "calendar picture" bent, with photographic rather than expressive aims. Panoramic Pharaonic subjects and woven copies of post cards have even appeared, to compete in the tourist marketplace with papyrus gimmickry. Americans and Europeans are sometimes concerned that children may be exploited by the studios. Most of this activity is voluntary, however, and the best workshops offer exceptional opportunities for personal artistic growth. Young people are paid as they learn, and their creations are a source of great pride. Indeed, it is rare in the Middle East that children's and teen-agers' expressions are so valued and encouraged. Education is supposedly mandatory now for children in Egypt, and half-day school sessions are offered nearly everywhere. Young people are free to weave either before or after their classes. Since 1952, when tapestry weaving began in Harrania, then later spread to other villages, the standard of living has improved immensely. In small settlements that had known few changes in 2000 years and little income except from farming, the boundaries have expanded. Village women with income from weaving have become more independent, and so feel less pressure to marry at extremely young ages. Men and women have normally been compensated equally on the basis of their abilities and production. These marvelous tapestries result from an inspired experiment which combined children, tradition, and economics. Earthy, exuberant weavings made by young people who had never heard of "art" are now treasured possessions of collectors and museums around the world. To read about tapestry techniques, go to Basic Weaves. Tapestries from Egypt Woven by the Children of Harrania, by W. & B. Forman and Ramses Wissa Wassef (Grague, 1968) is out of print but available from many used book dealers. It illustrates tapestries made by the first group of young children in Ramses' studio.